What does a Totally Nutz Franchise Cost? GO NUTS FOR TOTALLY NUTZ. Imagine owning a business that was so “crazy”profitable over just a few months,that you were afforded the rest of the year to travel, spend time with family or focus on other endeavors. Founders Matt and Yvette Barker had this same thought, many years ago, and began working on a family-friendly, wholesome business, that allowed them this freedom. Totally Nutz was born, and after years of hard-work, sweat and tears, the Barker family created a successful and proven business model that is allowing families all across the country to truly enjoy a seemingly impossible work-life balance. WHAT MAKES TOTALLY NUTZ SO GOOD? 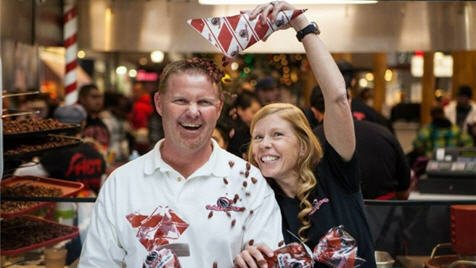 Totally Nutz offers customers a variety of fresh-roasted, glazed nuts. All of our nut varieties are all freshly roasted and glazed on location, with our cinnamon glazed almonds and pecans being the two biggest sellers. Depending our your target market you can use various nut varieties. We take pride in the quality of the nuts direct and fresh from the growers. Along with simple ingredients; cinnamon, sugar, and vanilla, all the aromas that will draw the customers to your business and having them going “nutz” for their favorite new snack. Not many companies can say they have built-in marketing, but at Totally Nutz, as soon as we start fresh-roasting, people start to follow their noses! 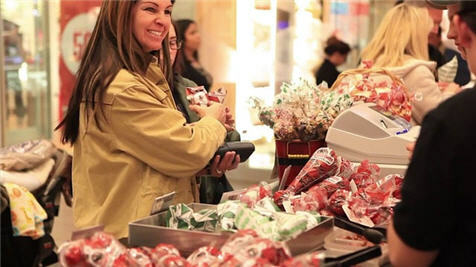 Totally Nutz Owners utilize Carts and Kiosks to provide our customers with their favorite snack. Whether you want to own one location or build an empire, Totally Nutz has the business model to suit. You’ve worked too hard, for too little, and want to flip the script. Then you’re in the right place! To find out more, and see whether you qualify for a Totally Nutz franchise, complete the information form and a Totally Nutz representative will contact you to start the education process, detailed below. Best of luck!